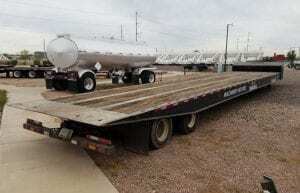 Midco Sales has a used Landoll 660 traveling axle trailer for sale at its trailer dealership in Chandler, AZ. This Landoll hydraulic equipment-hauling trailer measures 53′ long and has an air ride suspension system. A 20k winch is mounted at the front of the trailer. Midco Sales is an authorized Landoll dealer. Contact the sales office at (480) 999-0607 for more information on this used Landoll or on any of the Landoll trailers for sale.